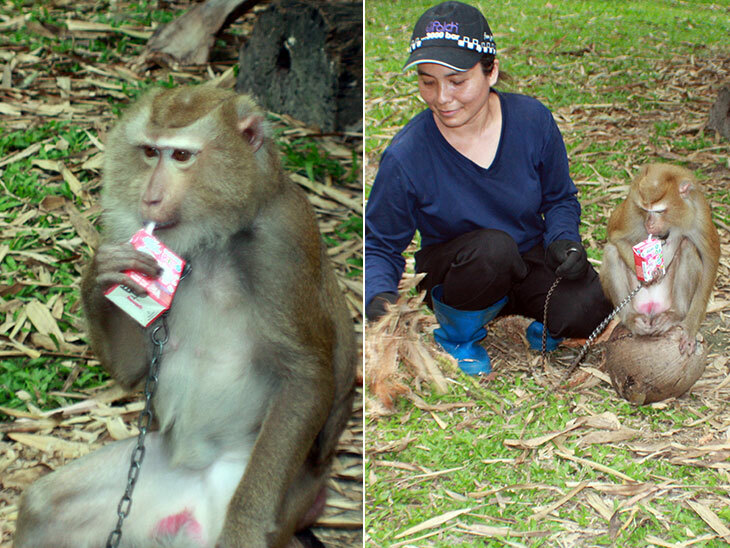 But seriously, why would you train a monkey, and to do what? Well, the Asia-Pacific region has more than a billion coconut palm trees, yielding something like 65 billion nuts per year. 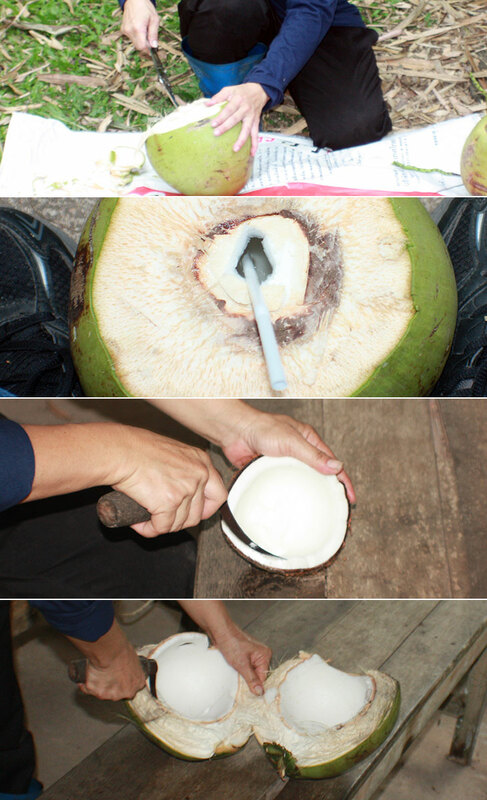 And although coconut-derived oils are used in everything from food and fuels to soap and cosmetics, you’ve probably never paid much attention to the fact that coconuts grow on trees. But now that I’ve mentioned it, you’re maybe thinking of that idyllic tropical scene, with tall palm trees swaying over the beach. 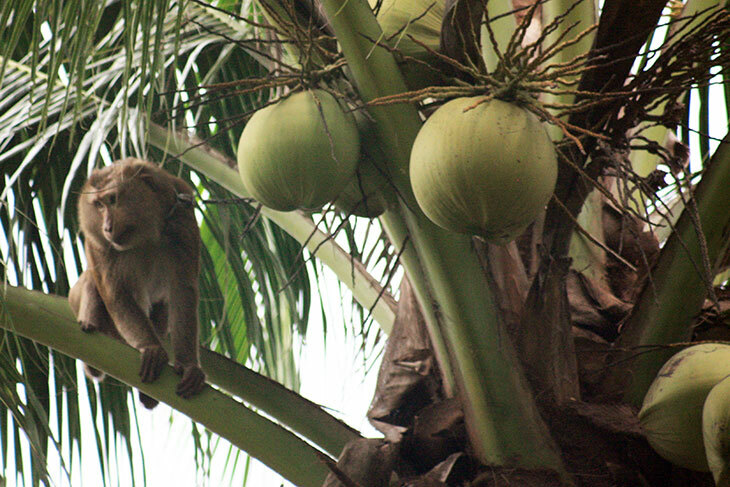 That’s where you’ll find coconuts. Right at the top. And if you’re lucky enough to be lazing on just such a beach, you’d be wise not to sit under the trees – no matter how tempting the shade might seem. 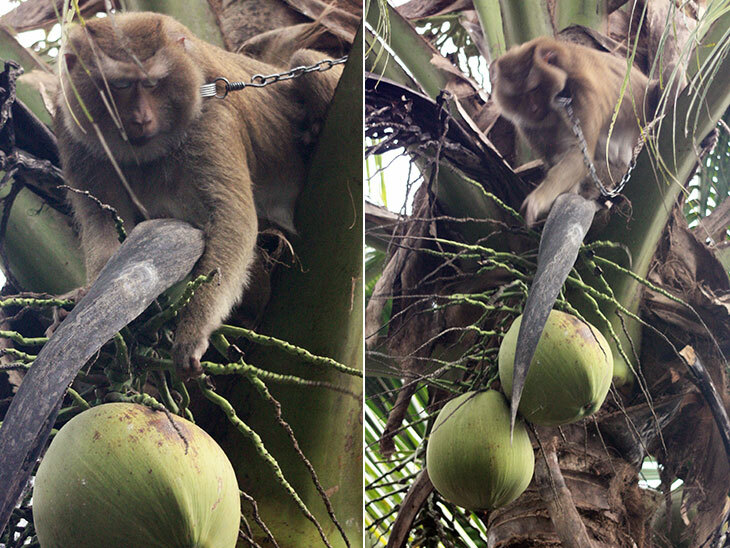 Falling coconuts and skulls are not a good match. The latter will break first. So now that you are visualizing those shady trees, how do you imagine the nuts are harvested? Yes, eventually the overripe nuts will fall off, and if you own the tree, maybe you’ll be lucky enough to be standing around when they do. But that’s not a very efficient method of harvesting. 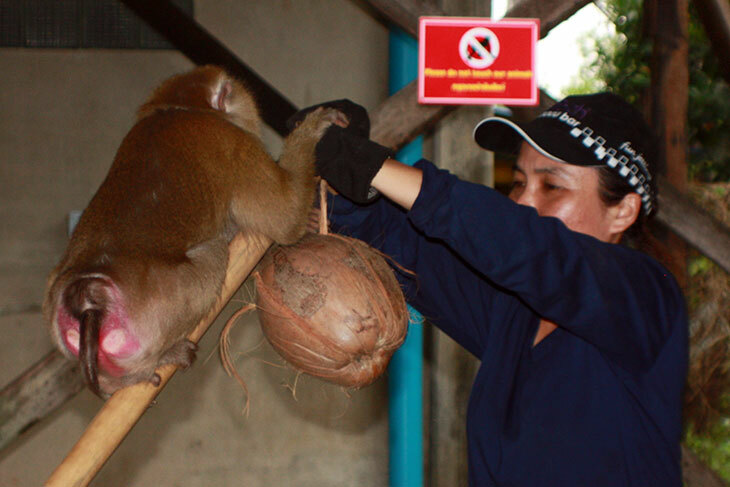 So, you send your professionally-trained monkey up there to harvest the nuts for you. 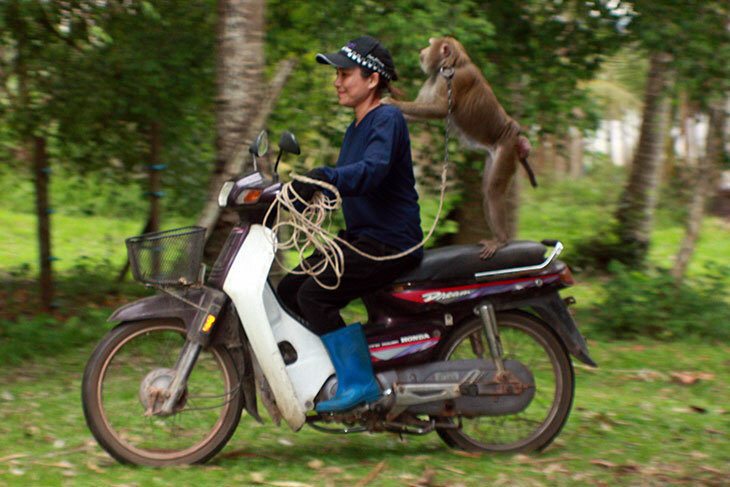 And that’s where Surat Thani’s monkey school comes in. Which is where I was yesterday afternoon. This is what getting friendly looks like. 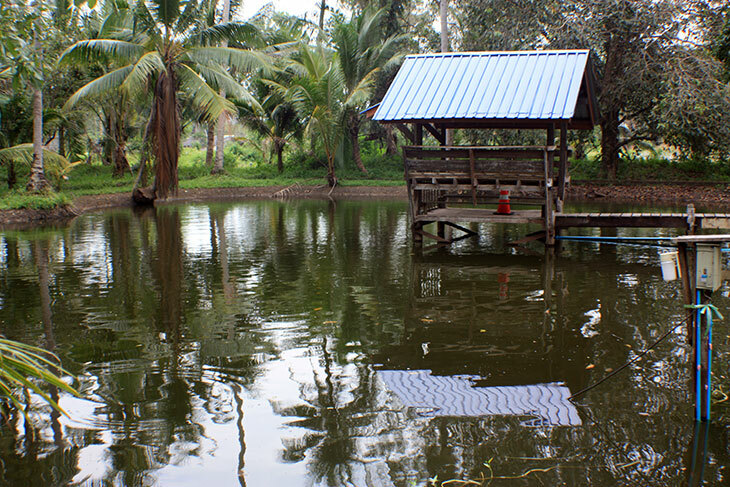 The school is operated by Khun Somjai Saekhow, and she’s being doing this for almost fifteen years. It was founded by her father, Khun Somporn Saekhow, who passed away some years ago, and she has kept the school running ever since. 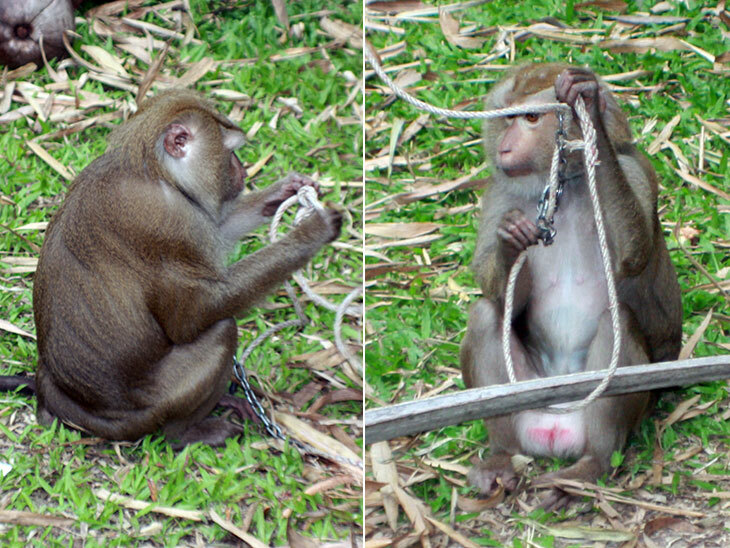 It is operated very much on the principle of being kind to the monkeys, rather than beating them when they don’t work to expectations. 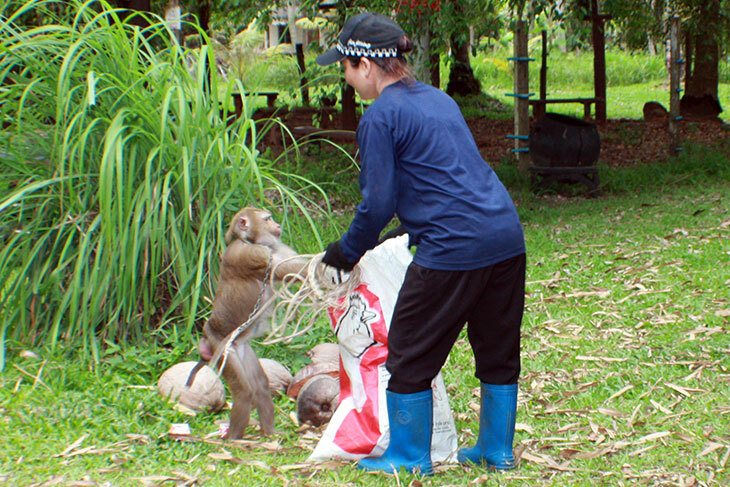 In fact Khun Somjai spends the first month, of the five or six needed to complete the training, making friends with a monkey. That way, they are much more receptive to the rest of the training. 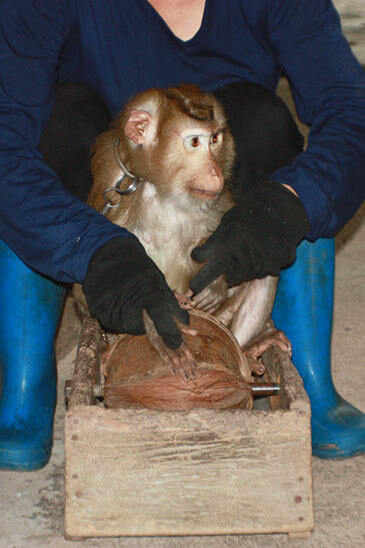 A coconut in a box is used as a training aid. 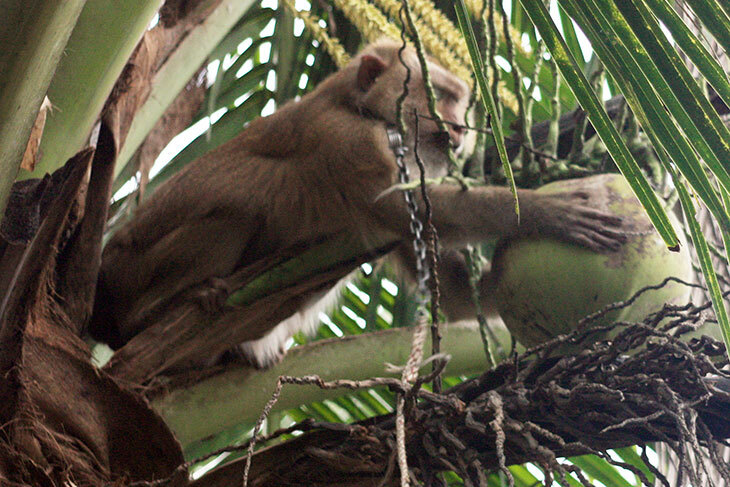 The monkeys are shown how to use their hands – and feet if they want – to spin the coconut, until the movement becomes natural to them. At this point they’re ready to move onto some simulated coconut felling. Mine decided it had to sit around for a while on my arm while it devoured a banana. 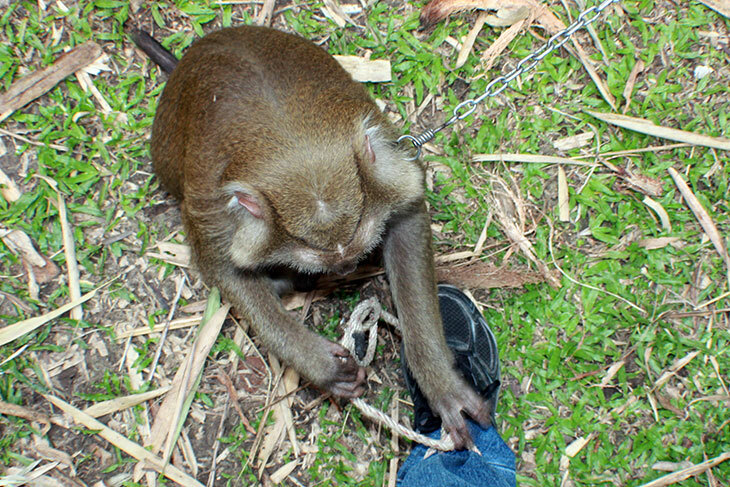 Did I mention I don’t like monkeys? But no big deal. Don’t forget that by this stage of their training they’re friendly. Sort-of. 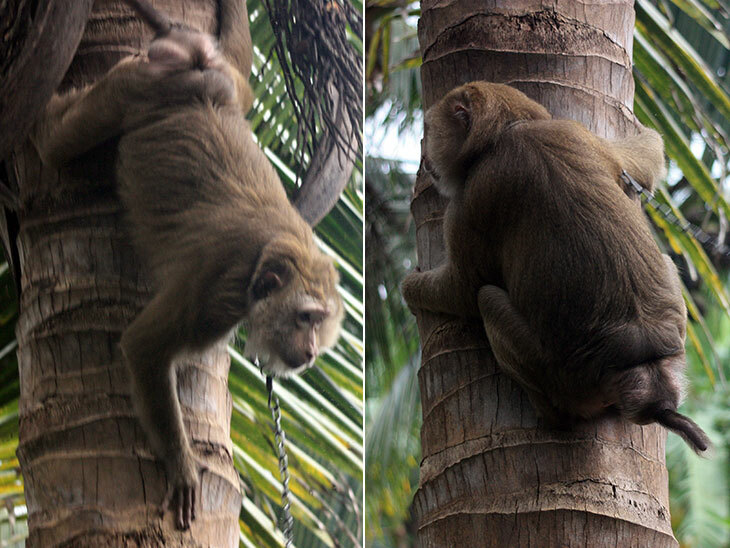 The monkeys need to move around at the top of the tree to find all the nuts, and in doing so they can easily get themselves trapped by the rope. 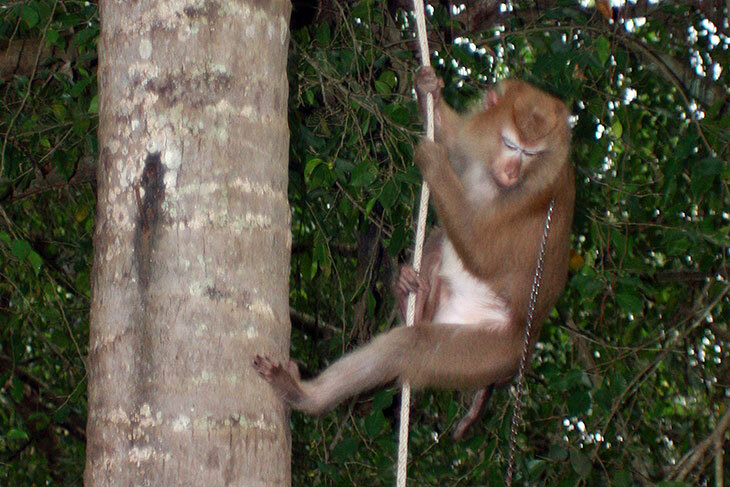 The last thing you need to do is shimmy up the tree to untangle your monkey. 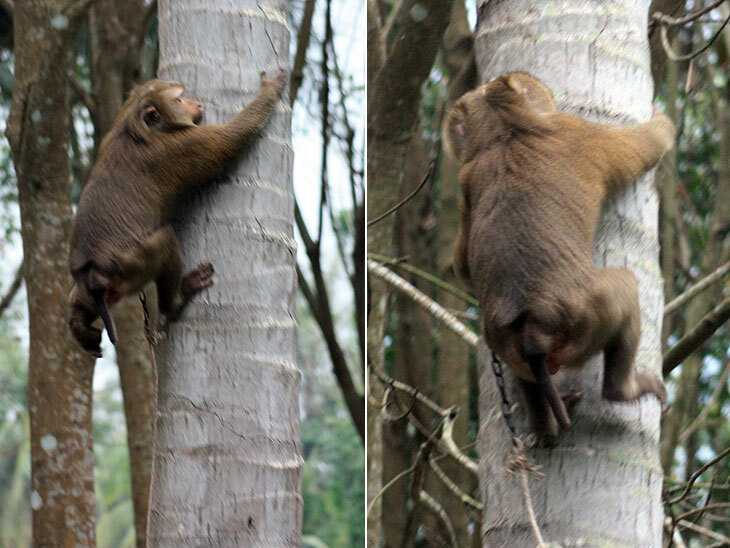 Much better if the monkeys can figure that out for themselves. An interesting afternoon. 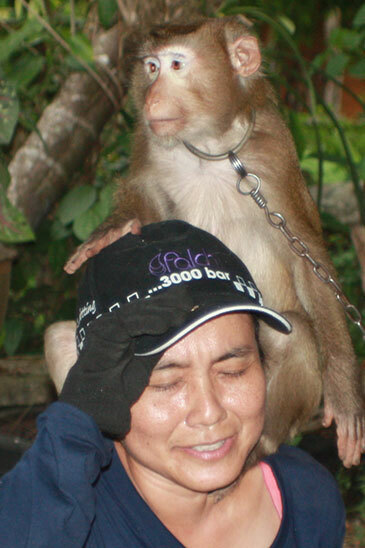 I still don’t like monkeys, but I do understand them a little better. If you’re in the area, I’d recommend a visit. You’ll find them on the web. Call or e-mail to make a reservation.